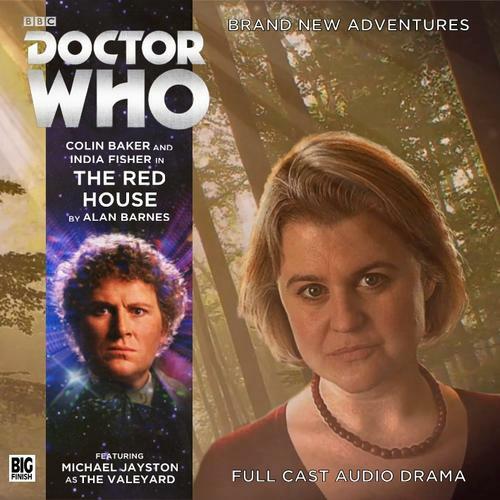 Colin Baker is the Doctor in The Red House. 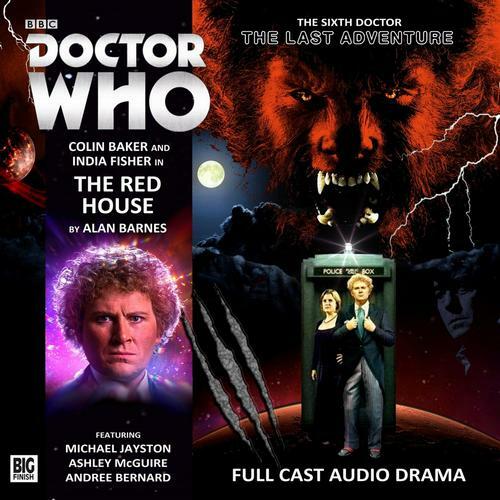 The Red House is the second serial in the four story arc that is The Last Sixth Doctor Adventure. Sadly, it turns out to be aggressively mediocre, relying solely on a very weak premise turned on its ear in a way that’s been done time and time again. The Red House is barely redeemed by the returning India Finish in the role of Charley and the presence of Michael Jayston as the Valeyard. The Doctor and Edwardian adventuress Charlotte Pollard find themselves in a small rustic village nestled in the woods at sunrise. The tolling of a bell should mean the beginning of a brand new day, but instead rings for an ominous curfew. As the villagers lock themselves in their homes, a pack of werewolves in strange bodysuits attack the duo. Separated in the chaos, Charley finds herself in a mansion overlooking the town, where a scientist vows to cure her of her bestial nature with the assistance of her mysterious and devious assistant. And the Doctor discovers that a second pack of werewolves lie deep in the forest, a group who want to do nothing more than…allow the sun to beat down about them so they can transform into their human forms! Alan Barnes is known for his work on both the Doctor Who and Judge Dredd comics. He also penned some of the definitive stories featuring Charley, including her introduction in Storm Warning, the conclusion of her first story arc in Neverland and her “departure” in The Girl Who Never Was, as well as the Fourth Doctor Adventure two-parter Trail of the White Worm/The Oseidon Adventure. It was a no-brainer to tap Barnes to pen The Red House as Charley plays a vital part in the proceedings with her history as a temporal paradox and how it ties into the Valeyard’s overall plan. While the parts with Charley and the Valeyard are fantastic, it’s less to do with Barnes’ script and more to do with the performances of India Fisher and Michael Jayston. In fact, the script for The Red House is incredibly average. Whereas End of the Line was incredibly atmospheric and creepy with an original and interesting crisis, The Red House attempts to make its bones through the simple fact of “The planet is inhabited by werewolves! Humans are the true savages, but so are the werewolves! Co-existance needs to occur, but humanity/Garou can’t get along, as both try to repress and oppress the other! And someone throws a nuclear missile for good measure!” Been there, done that, with very little to make anything truly stand out other than the presence of the Valeyard. By the time he’s traveled with Charlotte Pollard, the Sixth Doctor has been around for a while – traveling with Peri, then Mel (for the first time), and then Evelyn Smythe before Charley ends up on the TARDIS doorstep. Colin Baker plays a Doctor for whom this incarnation’s rough edges have been smooth away, leaving a confident, crafty Doctor. The stakes in The Red House are portrayed as much lower as those in End of the Line, so we get a Doctor who treats the situation with a lighter hear than usual. Aside from his back-and-forth with Charley (which rivals anything he had with Evelyn! On a different level and of a different type, of course), the Doctor shows guile in the form of attempting to hypnotize a werewolf pack, but in reality he’s using the pocket watch to reflect sunlight onto them! As well, we get a Doctor who’s truly dedicated to “winning,” refusing to let the worst come to past if there’s anything he can do about, including sacrificing himself and refusing to take the easy way out and rescue two werewolves from certain death when there’s a chance to rescue all of them. And I would be remiss in not mentioning the Sixth Doctor’s patented outrage at the psychic horrors Dr Paignton inflicts upon the werewolves in the guise of “curing” them. Baker does a fine job, as per usual, with The Red House, though he is overshadowed a bit by his companion and the story arc’s long-term villain! After appearing in in a cameo role during End of the Line, Michael Jayston makes a full appearance at the Valeyard, squaring off against Charlotte Pollard in an attempt to manipulate her to serve his own ends. Aside from appearing as the Valeyard, an amalgamation of the Doctor’s darker side that appears sometime between his twelfth and final regenerations, during the Trial of a Time Lord story arc, Jayston has enjoyed a storied career, appearing in films such as Cromwell and Nicholas and Alexandra as well as the classic Tinker Tailor Soldier Spy. It would have been incredibly easy for Jayston to simply play the Valeyard as over the top as possible – indeed there are a few moments where he chews the scenery – but Jayston’s performance here is pure Time Lord. He’s both arrogant and charming to Charley as he calmly and rationally explains to her why the Doctor is doing the wrong thing and why it’s up to HER to stop him…after all, she knows all about Time Lord non-interference, doesn’t she? Of course, it’s all a cover for the Valeyard’s true purpose. Jayston perfectly nails the mix between evil and intriguing, and listeners who know little about the Valeyard are given enough to hook them for the rest of this story arc. After leaving the Eighth Doctor, Charlotte Pollard ended up traveling with the Sixth Doctor for eight main range stories, from The Condemned through Blue Forgotten Planet. India Fisher has always been an unexpected delight with her Big Finish work, through her travels with Eight and Six, a wickedly good companion chronicle in Solitaire, and the anniversary story The Light of the End. Charley’s banter with the Sixth Doctor early on in The Red House announces her presence early, with a hint of the frustration but none of the underlying issues that afflicted Six and Peri’s early travels. It’s a case of one friend exasperated because her friend doesn’t quite speak her exact language…which makes perfect sense, going from the romantic and quick on his feet Eighth Doctor to the bombastic and “I am never wrong” Sixie! It goes on through her angry interactions with Dr Paignton – Charley doesn’t beg for her freedom so much as demand it – and her interactions with the Valeyard. Fisher carries her end of the conversation as a character who knows all about Time Lord and Celestial Intervention Agency shenanigans, her normal era of annoyance and cockiness giving way to an understanding and a bit of curiosity with his presence. The Red House shows just how great India Fisher was with Big Finish – anyone who can carry their own opposite Paul McGann, Colin Baker, and Michael Jayston is well deserving of any and all praise! The rest of the supporting cast, however, doesn’t carry their weight. If you asked me to pick them out of an audio line-up, or press me to describe which character had which motivations, I would be very hard pressed to do so! It doesn’t help that Big Finish just doesn’t pull off the werewolf voices AT ALL. In the suits meant to protect them from the sun, the actors playing the werewolves sound like they’re speaking through about ten feet of plumbing, and when free of the suit’s confines, it doesn’t get any better as they sound like they gargled ten gallons of salt water before their performance! It’s a far cry from the well done werewolves in Loups-Garoux. The music work in The Red House consisted of a lot of drums, especially because of a good bit of chase scenes and moments of tension throughout the story. But the sound work really stood out. It gave off a sort of Ravenloft vibe – a humble village, dark woods, werewolves stalking the night with doors being bashed in and branches breaking, and the works of a mad scientist with cackling equipment and screaming patients. The Red House serves one purpose – to show the beginning of the Valeyard’s ultimate plan against the Doctor. Beyond that, there’s not much to recommend other than the performances of Colin Baker, India Fisher, and Michael Jayston. This one left me a bit disappointed, and I’m hoping the presence of Henry Gordon Jago and Professor George Litefoot in the follow-up to this story means a story with a little more bite to it. Cobi’s Synopsis – An average script is brought up by the performances of Baker, Fisher, and Jayston, but The Red House still lacks any long-term bite. Colin Baker is the Doctor in…The Last Sixth Doctor Adventure – Stage Fight. This entry was posted in Big Finish Review and tagged Big Finish, Big Finish Audio, Big Finish Review, Charley Pollard, Colin Baker, Doctor Who, Doctor Who Audio, Doctor Who Review, India Fisher, Sixth Doctor, TARDIS, The Last Sixth Doctor Adventure, The Valeyard. Bookmark the permalink.